What Is Zydeco Music? A Good Basic Explanation. Many say that they have never heard Zydeco music -- but they really have. It is highly popular in various parts of the country and even in some foreign countries. You probably have even heard it as background music?for Popeye's chicken and various Automo bile commercials. It has played an important role in many movies -- usually with a Louisiana locale. You may have heard it during a half-time show of a recent Super Bowl, at the closing ceremonies of the Summer Olympics or during the TV presentations of two presidential inaugurations. Of course, if you have been to the French Quarter in New Orleans, every T-shirt and souvenir store is constantly blaring Zydeco music -- you can't escape -- and don't want to. Not only is the dance enjoyed by those from 6 to 106, the basic steps are easy to learn. Before most events and club dances a short lesson is always taught to the newcomers so that they can enjoy the evening on the dance floor. Zydeco music is dancing music; said to be party music. You will enjoy it. Briefly, people surmise that the dance originated in the country (prairie) areas of South Louisiana (Acadiana -- a group of 22 Parishes) by the Creole population of the time. I would put the date of the dance in the 1930s when the Zydeco music came into its own -- before that it perhaps went through stages such as church Juré (hand clapping, body striking and foot stomping -- non-instrumental [not allowed in churches at that time]), la la music, zarico, to Zydeco -- along with the music. Creole music was very similar to Cajun music but after WWII, Creole music began to take on different influences of other styles of music. While the fiddle (from Cajun style music) is almost always absent, Zydeco is usually played with accordion, electric guitar and bass, drums, and a sometimes even some brass (with larger bands). Perhaps the most distinctive instrument of Zydeco (besides the accordion) is a corrugated metal rubboard (called a 'frottior'). 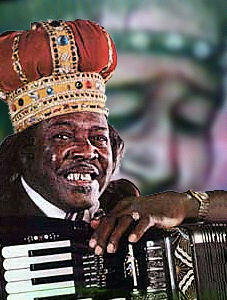 The first nationally recognized Zydeco songs were in the 1950's by Clifton Chenier ("King of Zydeco") and Boozoo Chavis. The common explanation for the term Zydeco is that it comes from the Creole saying "Les haricots sont pas salés" meaning "The beans aren't salty". This phrase means something like times are really hard if you don't even have salt for your beans, much less meat in the pot. This phrase has appeared in many Creole songs and is assumed to have been changed slightly to "Zydeco est pas salé" as sung in many of the original Zydeco songs. Zydeco is dance music played by Creole French speaking people of African descent who historically lived on the prairies of Southwest Louisiana. At its core, it is the sound of an accordion paired with the scrapping of a rubboard. The accordion may be a single-row diatonic model (of German origin but also now produced in Italy, Louisiana and other places), a triple row diatonic model, or a standard keyboard accordion. Is Zydeco music the same as Cajun music? Cajun and Creole people have lived and worked side by side for generations. They have shared and traded many aspects of their cultures including music. Some Zydeco songs are played by Cajun bands and some Cajun songs are played by Zydeco groups, but they are two different types of music. One major difference is that you'll find accordions, fiddles and steel guitars (rare now) in Cajun groups, but not in Zydeco bands -- where you will find accordions and rubboards. Do they play Zydeco in New Orleans? New Orleans has great musical traditions of its own and the people take pride in their own music. It is claimed that the Zydeco center of the United States stretches along the Interstate 10 corridor from New Orleans, Louisiana to Houston, Texas, with the major terminals being assigned to Lafayette, Louisiana and Houston, Texas. However, it must be noted that there are more bands playing Zydeco that reside outside of Louisiana and Texas (mainly along both the East and West coasts of the US), than inside Louisiana and Texas. Also, foreign countries such as France, The Netherlands, Germany, Denmark, United Kingdom, Canada, Australia, New Zealand and even Japan have some Zydeco bands and even hold regular major Zydeco festivals at some locales. Of course, residents of Louisiana and Texas claim that these “aren't REAL Zydeco bands” -- but to my ears, they do sound as if they are -- music is worldwide. The term is thought to have derived from a Creole expression "Les haricots sont pas sale" which means "the snap beans aren't salted." The expression is used in several Creole songs and eventually shorted to just "Les Haricots" came to also mean a special Creole dance. Since there were no standard spellings for Creole words, Zydeco was one of the many spellings used. Michael Tisserand in his excellent book "Kingdom of Zydeco" spends a whole chapter talking about how this spelling has become the standard spelling! Besides meaning 'a type of music', 'a style of dancing', Zydeco also has a third meaning -- 'a party'. Are there different styles of Zydeco music? There sure are! The old split was between piano accordion players, the most famous being Clifton Chenier, and button box players, the most fam ous being Boozoo Chavis. Playing button box used to imply you were country and piano accordion meant you were urbaner, but nowadays things just aren't that simple anymore. You can hear artists mixing button box playing with hip hop beats and even a real traditional performer like Geno Delafose will pick up a piano accordion at least part of the night. Basically, everybody has a certain idea of what makes their music Zydeco music, but they all season it differently to fit their taste. Zydeco is a popular accordion-based musical genre hailing from the prairies of south-central and southwest Louisiana. Contrary to popular belief, it is not Cajun in origin; rather, Zydeco is the music of South Louisiana’s Creoles of Color, who borrowed many of Zydeco’s defining elements from Cajun music. (In turn, Cajun music borrowed many of its traits from Creole music.) The word Zydeco (also rendered zarico, zodico, zordico, and zologo) derives from the French expression les haricots, meaning "beans." Folk etymology holds that the genre obtained this name from the common Creole expression "Les haricots sont pas salés" ("The beans aren’t salty"). This phrase has appeared in many Creole songs, and serves as the title of a popular Zydeco recording (also called "Zydeco est pas salé"). Without debunking this etymology, folklorist Barry Jean Ancelet has noted that this explanation has been generally accepted without much critical analysis. He also has observed that variations on the word Zydeco appear in black French songs from as far away as the Indian Ocean. Most interestingly, Ancelet contends that Les haricots sont pas salés is a lyrical metaphor for difficult times: in the past, Creoles seasoned their food, such as beans (les haricots), with salted meat -- when times were bad, salted meat became too expensive, which explained why "the beans aren't salty." Zydeco is actually the most modern form of Creole music from Acadiana, and it first appeared [ed: on the national scene] after World War II, when pioneers of the genre like Clifton Chenier and BooZoo Chavis combined more traditional sounds with new rhythm and blues elements. In fact, the first Zydeco-ish recording was Clarence Garlow's hit "Bon Ton Roula," issued in 1949 on the Macys label. (Earlier forms of la musique créole were called, for instance, juré, la-la, and pic-nic, and are perhaps best represented by the recordings of Creole accordionist Amédé Ardoin.) Zydeco has evolved considerably over the decades and now draws on pop music sources like soul, disco, rap, and even reggae. It also is increasingly performed in English, instead of in its original Creole dialect. And, oddly, it generally is regarded as "party music" -- even though early Zydeco drew heavily on "low-down" blues elements (as demonstrated by Clifton Chenier's repertoire). Zydeco frequently appears in movies, TV programs, and commercials -- even more so than Cajun music, which, unlike Zydeco, has retained much of its traditional flavor. It has attracted a loyal worldwide outside Louisiana, as demonstrated by the large numbers of "Zydeco dancers" on the east and west coasts. Despite its commercialization (and Americanization), Zydeco remains a relevant means of cultural expression for the Creoles of Acadiana. GARY ADDS: to expand on the above, you will find, in modern Zydeco music elements of Cajun, African, Island, Blues, R&B, Jazz, Swing, Soul, Hi?p-Hop, Rap, Reggae, Dixie, Latin, Ska, Contemporary, etc. It is not uncommon for Zydeco bands to “steal” or perhaps I should say “borrow” from other genres, or even take songs from other bands that they heard playing the night before and change words and some music licks to create new songs. The audience and the dancers don't care. There are very few Zydeco songs that have written (published) music scores and often bands may not play the same song the same way twice in succession. There is much freedom. Also, there is a lot of friendly competition between the “REAL” Zydeco bands of Louisiana and Texas. Most players are related in some way and all know each other -- they are like family. They also switch bands or fill in for each other -- as they all know the same music. Often Zydeco music, especially the older music, is of “Folk Style” and may follow a pattern of AABB and maybe an added C. That is a musical stanza is played then repeated. It is replaced by another stanza, which is also repeated. Then it may, or may not be followed by a third stanza -- which is not repeated. Then back to the A stanza, etc. Think of the nursery rhyme “Baa Baa Black Sheep Have You Any Wool?” (the A stanza). “Yes Sir, Yes Sir, Three Bags Full” is the repeated A stanza (with different words). Then, in this case, back to the A stanza with the repeating of the A stanza -- one time for the ending of the song. There are many variations of this “simple” music. Most Zydeco music is played at dance clubs, party gatherings, trail rides, festivals and other outdoor events -- usually at a place where many will be dancing. A typical Zydeco band will consist of 5 musicians -- accordion, rubboard (also called a scrub board, washboard or a frottoir (Fr. ), bass guitar, guitar, drums. The accordionist is usually the leader of the band, but not in all cases. The bigger Zydeco show bands who play for large crowds for the whole evening can have added pieces which may include brass (trumpets, saxophones, trombones), keyboard, bongos/congas, etc. Many times their music is for audience excitement and show and is so fast it becomes difficult, if not impossible to dance -- due to the speed of the music. Typical Zydeco music is not limited to, but is played in the beats per minute (bpm) range of 120-200 bpm; a favorite range for advanced dancers being somewhere in the range of 165-180 bpm. The music is of the 4/4 variety (timing of four quarter notes per measure). Often, every second beat is accented (sometimes know at the back beat.) The drummer will usually play a subtle or pronounced riff during the last measure before a stanza change (see above) which the dancers can perceive and even change their dance style at the start of the next stanza of music. Zydeco dancing allows partners to be doing different steps at the same time, particularly when in the fully open position. [3 positions: closed (with contact like a ballroom position), slightly open but with hand contact (one or two hands), open with no contact EXCEPT a short joining of hands for (at least) the 7th and 8th count of the 8 count dance step.] There are, of course, exceptions, especially with exhibition Zydeco dancing. As everyone quickly learns the easy Basic Step, all can dance with each other. Therefore a beginner and an experienced dancer can enjoy a dance together as the more advanced dancer can easily tone down their dance to the level of the partner. Often, at a dance, dancers seek new partners after each dance, thus dancing with many during the evening -- a great way of meeting new people or for experiencing many different styles of Zydeco dancing. In general, when asked, one never refuses an invitation to a short Zydeco dance. There are, of course, exceptions to that rule. The dance can be done in a minimalistic fashion by the partners on an often crowded dance floor, or, when space is available, done in a grand exhibition style with lots of flairs. Zydeco can be danced by all ages. The dance can take only minutes to learn the Basic Step and years to become a very advanced demo dancer.